The Year 2017 sees us at MAB celebrating our 20th Anniversary. Twenty years of contribution and achievements. It is important to look back to see what we have achieved, to review our strengths and our weaknesses; to reflect on what we did well and how we could have done things differently. Indeed, twenty years is a long time and we can be proud of what the Muslim Community has achieved in Britain. In this magazine, we present to you some highlights of what we consider milestones in MAB’s journey. Let’s remember that this has only been possible thanks to your continued support and contribution; and the commitment and dedication of MAB members. One of MAB’s missions has been to guide and accompany Muslims in their quest to construct their identity. And today many Muslims, especially within our youth wonder what it means to be a British Muslim. MAB’s leaders have found that British Muslims have been the engine of selflessness work and contribution. In the following pages, MAB will provide you some keys to feeling confident at home, here in the UK. Islam teaches us about the importance of looking after our body as part of a comprehensive regime to cater for mind, body and soul. In our busy life schedules, we very easily tend to forget about our health. We have included an article about health, as it presents us with an important challenge. You will find in the magazine why is it important to keep or become healthy; why we must treat our body with mercy and respect; to allow us to continue the journey. Also, read a little about the importance of faith and faith communities; and how we can establish the Quranic injunction to: “Work together in matters of righteousness and piety”. Finally, please take time to look at the work done by some Islamic organisations and the products designed and sold, as featured in this magazine. 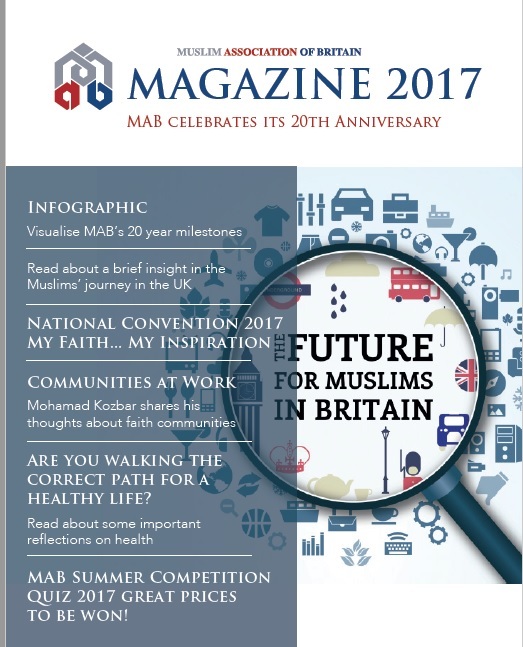 I hope you enjoy reading the MAB magazine; and I hope you get a chance to partake in our Summer Quiz challenge, in a bid to win some lovely amazing prizes, including a Hajj trip. I ask Allah to bless you, your time, family and wealth.